This sort of image springs to mind when I see claims of forced fluoridation. Aren’t activists like “Forced Fluoridation Freedom Fighters” misrepresenting the real situation? Credit: FALUN DAFA MINGHUI.ORG – enacting claimed forced feeding in Chinese camp. I think the “freedom of choice” argument is the most reasonable argument that anti-fluoride campaigners can use. Unfortunately for them, they usually only resort to it after their “science-based” arguments have been exposed as misleading or completely false. And even then, they usually present their “freedom of choice” argument in a naive and hostile way. Have a look at this discussion from a local anti-fluoride Facebook page. Here an opponent of community water fluoridation (CWF) has declared she doesn’t want fluoridation – fair enough. She has also declared that she doesn’t drink fluoridated water. Also fair enough. I would say she has exerted her freedom of choice – she doesn’t drink fluoridated water so must have made other arrangements. And I am all for people exerting that right – even when they refuse to partake of a safe and effective social health policy. But, in the next breath, she declares that she doesn’t have freedom of choice! How does that work? It is as illogical as someone who votes on election day and then declares to everyone that they have been denied their right to vote! Some campaigners are even worse – declaring that they are being forced to drink fluoridated tap water! That brings up a picture of someone being held down and water being forced down their throats. But we know that does not happen. Worse – we also know that most of the people making this claim do not even drink unfiltered tap water. The serious anti-fluoride person almost always uses a system to remove fluoride from the tap water, or finds a different source of water to consume. When New Zealand councils provide “fluoride-free” public taps they get very little use. This suggests that the anti-fluoride campaigners (who may have lobbied for the taps) have already made their alternative arrangements (see Fluoridation: Freedom of choice – and responsibility). So, I just don’t buy this naive “freedom of choice” argument – especially when presented in such aggressive ways. The fact is that where most social policies are concerned they are not forced on people – there is usually a chance for objectors to avoid the policy or use alternatives. No one is forced to send their kids to secular schools or to use free hospitals. There are alternatives in such cases. Anti-fluoride campaigners should just stop using this argument at the personal level – it just discredits them. Where it does have validity is at the community level. Because it is a controversial issue there is usually some level of public consultation when health authorities recommend the introduction of fluoridation. The public has a right to feel aggrieved when they are denied their freedom of choice if decisions to start or stop fluoridation are just imposed on them by officials. But that “freedom of choice” argument is an argument for democracy – not an argument for or against a social health policy. Unfortunately, many anti-fluoride campaigners will still advance their personal “freedom of choice” arguments even when decisions have been made democratically by using referenda or some other method of polling voters opinions. It’s like a voter who supported a minority party in a general election claiming their rights are being violated by the party or parties with the most votes actually got elected! So what “freedom of choice” are these die-hard anti-fluoride campaigners really thinking about? If they have already exerted their own personal freedom of choice by use of tap filters or alternative water supplies, and they have been given a chance to express their views or take part in a democratic referendum, what freedom do they think they have lost. I can only conclude the freedom that really concerns them is their perceived freedom to prevent others from taking advantage off a safe and effective social health policy. And that attitude is hardly democratic. Social health policies inevitably raise the issue of the individual’s freedom of choice. While debates around these policies often concentrate on questions of fact, scientific consensus and reliability of evidence, these tend to be surrogates for the underlying values issues. To what extent should I sacrifice my freedom of choice, or my freedom of choice to decide for my children, for the good health of the community? And what if my freedom of choice violates the freedom of choice for others? Paul Offit discussed these issues in a recent Point of Inquiry podcast – Paul Offit, MD, on Measles in the Magic Kingdom and the Anti-Vaccine Movement. He is a Professor in the Division of Infectious Diseases and the Director of the Vaccine Education Center at the Children Hospital of Philadelphia. Offit is the author of the book Do You Believe in Magic? 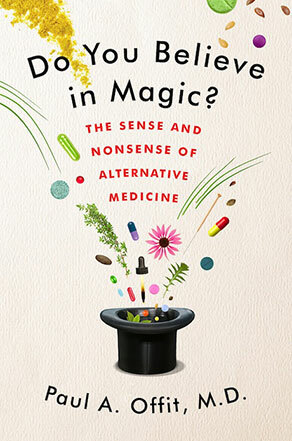 : The Sense and Nonsense of Alternative Medicine . He basically talks about the spread of measles throughout California and neighboring states because of a source of infection at Disneyland. Although measles were eliminated in the U.S. by 2000, the misinformation of the anti-vaccine movement has caused a return of a full-fledged outbreak. Paul makes the comparison of opposition to vaccination with opposition to blood transfusion. 1: Blood transfusions. A person my refuse to accept treatment involving blood transfusion because of their personal religious beliefs. More questionably they may refuse on behalf of their children. However, the consequences are limited to the person or her child. The decision does not harm the community at large. 2: Vaccinations. A person may refuse a measles vaccination for themselves or their children. But in this case the consequences are not personal – they affect the whole of society. By lowering the degree of immunisation in the community they threaten the lives of others – particularly the most vulnerable, children. In these two cases the person has refused an intervention, a medical treatment or vaccination, which could be seen to violate their freedom of choice – or even to violate their body. In the first case the consequences are personal, limited to the person who made the wrong decision. But in the second case the consequences are social. An personal wrong decision has taken away the freedom of choice, the health and in some cases the lives, of others in society. A bit like the personal decision to drive on the wrong side of the road. Society has taken away a small personal freedom of choice in our road rules to protect the lives of all of us. 3: Fluoridation. Social health policies like community fluoridation of water, salt, milk, etc., are recognised as being safe, beneficial and cost-effective. But they are opposed by a vocal minority. Activists will passionately promote the freedom of choice argument and, considering they don’t have the scientific evidence on their side this is often seen as their strongest argument. After all, it is values-based and therefore can’t be tested and rejected by evidence. But, this third case is different to the other 2. The act of fluoridation or not is social, taken by society as a whole or their representatives. An person may contribute to the decision but cannot decide the issue by a personal action as they can with vaccinations or blood transfusions. Although individual political action, or dissemination of information or misinformation, may influence that social decision – and hence the social consequences. Fluoridation does not involve an intervention or treatment, medical or otherwise. No one is forced to drink fluoridated water or milk, or to consume fluoridated salt. The freedom of choice argument is invalid here because there are always alternatives. Despite actively promoting the freedom of choice argument even the NZ anti-fluoride activist Fluoride Free NZ provides information on these atlernatives. They list alternative water sources, distillation, ion exchange filters and reverse osmosis. Most of these choices are cheap and available. So what is driving anti-fluoridation propagandists? Unlike opponents to blood transfusion they cannot argue freedom of choice to refuse an intervention on religious grounds. There is no intervention. The only personal imposition is that they may wish to buy a water filter (many already have these) or buy water from a different source. Again, unlike opponents of vaccination they cannot argue freedom of choice to refuse an intervention even on grounds of personal belief – because there is no personal intervention. Given the lack of any forced or personal intervention I am forced to conclude the freedom of choice issue that concerns the anti-fluoride activists is their freedom of choice to decide the oral health quality of other members of their community. And given the health and scientific expert consensus on the issue they are really arguing for their freedom of choice to decide the oral health of others on the grounds of their own minority personal beliefs or convictions. The freedom of choice the anti-fluoride activists are promoting is their freedom of choice to decide health outcomes for others – not themselves.